How Can New Construction Piers Help Your Atlanta Commercial Business? When it comes to your business’ structural integrity, the last thing you want is for your foundation to start failing. Foundation failure is a serious problem that many business owners in the Atlanta, Georgia area deal with. Once the foundation starts to fail, it will lead to problems in other areas of the structure: cracks in the foundation or walls, leaning or bowing foundation walls, sticking windows or doors, and sloped or uneven floors. These issues can be a hassle and often require expensive repairs, which can hurt your business. There is, however, a way to prevent foundation problems from developing in the first place. New construction piering is an increasingly popular trend in Atlanta. Helical piers from ECP are excellent for new construction piering. ECP (Earth Contact Products) is a leading foundation repair product supplier. By using only the best products from reliable sources like ECP, we are able to get you the best results possible. These piers are designed to drive deep into the ground, making them suitable for foundations that require resistance against both tension and axial compression forces. Helical piers work as a more effective replacement for concrete piers, since they can be installed easily and the load can be immediately transferred to them. 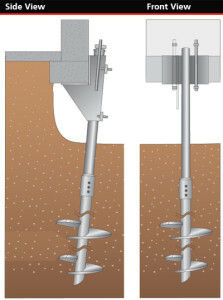 Because they are made to be driven deep into the ground, helical piers reach beyond the layers of active soil and anchor into the more stable soils. This provides the new foundation with an added level of support, ensuring that it remains structurally sound for years to come. Where Can Commercial New Construction Piers and Anchors be Used? Commercial new construction helical piers are a great way to make sure that your new construction project’s foundation is super strong and stable. The expert team at Atlas Piers can install helical piers to support your commercial new construction project. In addition to new construction helical piers being versatile enough to use in nearly any new construction project, Atlas Piers offers our premiere helical pier installation services to a wide service area. From the Atlanta area, where we are based, and throughout the state of Georgia, to cities in states as far away as Tennessee, North Carolina, South Carolina, and even Florida. We travel all over to help out our customers with their commercial new construction projects. If you are building a new structure for your business or commercial projects, contact Atlas Piers today. We can provide you with new construction helical piers to maintain the structural integrity of your building for years to come. Don’t let foundation problems catch you by surprise in the future; invest in new construction helical piers from Atlas Piers today and rest easy.